Drawing on his legendary firearms knowledge and combat experience, U.S. Navy SEAL and #1 bestselling author of American Sniper Chris Kyle dramatically chronicles the story of America—from the Revolution to the present—through the lens of ten iconic guns and the remarkable heroes who used them to shape history: the American long rifle, Spencer repeater, Colt .45 revolver, Winchester 1873 rifle, Springfield M1903 rifle, M1911 pistol, Thompson submachine gun, M1 Garand, .38 Special police revolver, and the M16 rifle platform Kyle himself used. American Gun is a sweeping epic of bravery, adventure, invention, and sacrifice. 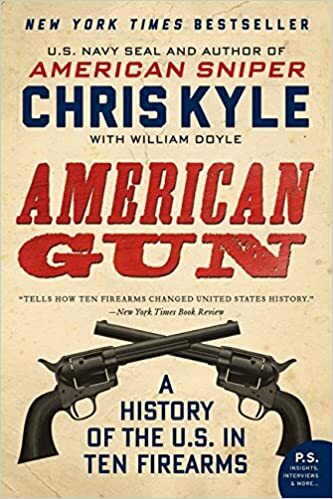 Featuring a foreword and afterword by Taya Kyle and illustrated with more than 100 photographs, this new paperback edition features a bonus chapter, “The Eleventh Gun,” on shotguns, derringers, and the Browning M2 machine gun.